What was once Ilford’s best known monument was unceremoniously demolished in 1923 by the Port of London Authority because it was inconveniently sited in the middle of a large plot of land they had acquired for use as playing fields. 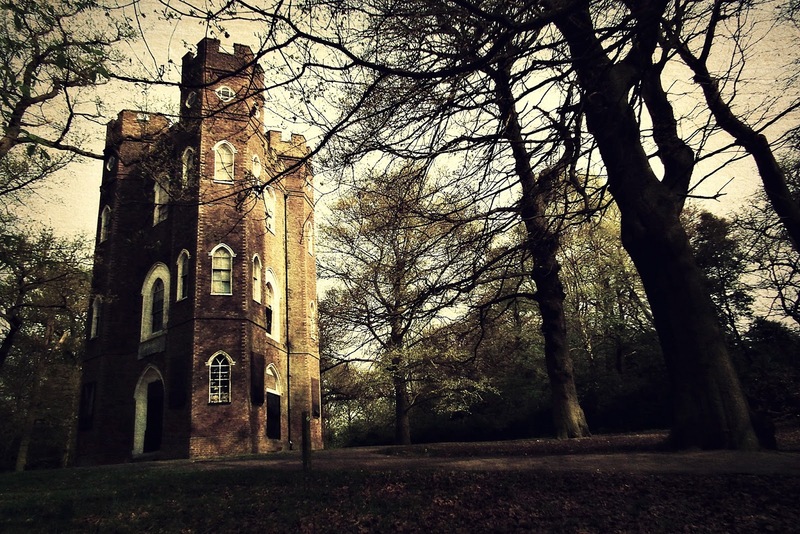 The triangular castle (very similar to Severndroog in Oxleas Wood on Shooters Hill) was built in 1765 at a cost of £420 by Sir Charles Raymond of Valentines House in Ilford. 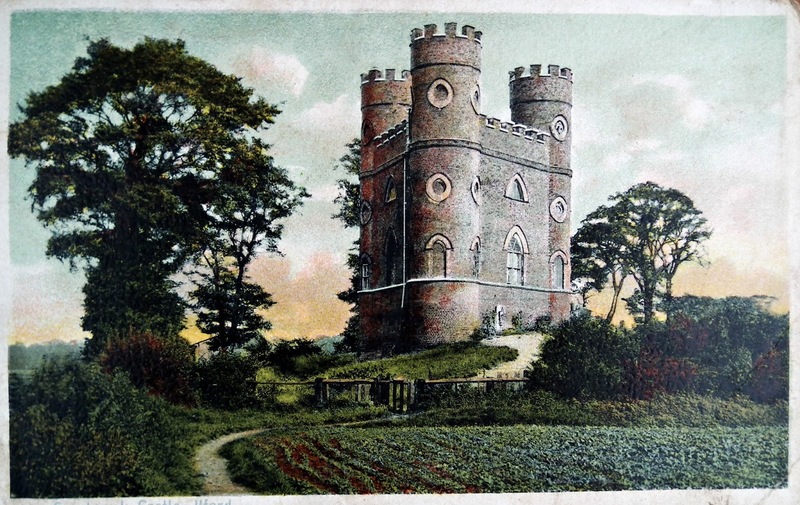 Sir Charles, a ship owner, banker and a member of the East India Company, intended what became known as Raymond’s Folly to be a mausoleum complete with a crypt containing fourteen loculi to hold the family coffins, a ground floor chapel and an upper floor refreshment room for use during interments. According to local antiquarian George Tasker in his 1901 volume ‘Ilford Past and Present’, a descendant of Sir Charles stumbled across family documents which revealed that his ancestor had failed to see eye to eye with the Bishop of London, Richard Terrick, over the finer points of the consecration ceremony for the mausoleum. The Bishop put his foot down and refused to consecrate the building which meant that it was never used for the purpose for which it had been built. It survived as a farm outbuilding, tenant farmer accommodation and even as an Admiralty observation tower during the Great War, until the fateful day when the land on which it stood was sold to the Port of London Authority. 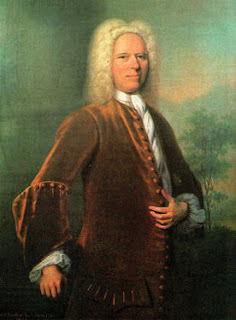 Sir Charles was born into a family of seafarers in Devon, at Withycombe Raleigh near Exmouth, in 1713. He made his maiden voyage to Bengal and Madras as a 16 year old on an East Indiaman captained by his uncle. He came into his first command as a callow youth of 21 when the East India Company promoted him to the captaincy of the Wager. Trading on his own behalf as well as for the Company, Sir Charles became a powerful and wealthy man, retiring from the sea relatively early to concentrate on a career as an East India merchant, banker, manager of the Sun Life Insurance Office, a director of the South Sea Company and High Sheriff of Essex. He was made a baronet in 1774. He married Sarah Webster, the illegitimate daughter of John Webster of Bromley in 1743 who bore him five children. The family originally lived in Wellclose Square (one of London’s semi mythical locations where they would have been neighbours of Emmanuel Swedenborg, Hayyim Falk, the Baal Shem Tov of London, and poet Thomas Day who was born there in 1748) but moved to Upton in West Ham in 1750 and to Ilford in 1754 where he bought Valentines House and the neighbouring manor of Highlands where the mausoleum was later to be built. Sir Charles kept a menagerie of exotic animals at Valentines, including peacocks and a pair of secretary birds from South Africa, and laid out new gardens. From one of his vines Capability Brown took a cutting in 1768 from which the great vine of Hampton Court was propagated, now the longest vine in the world and a venerable 250 years old. Sir Charles also collected curios and objet d’art and crammed the mansion at Valentines with them so thoroughly that one contemporary said the whole house could “be called a Cabinet of Curiosities”. Among his prize items were a dark marble statue from the island of Elephanta, a unique leather bound folio containing 814 Chinese paintings of oriental plants and insects with their medicinal uses described in Chinese and English, Hogarth’s painting of Southwark Fair and quantities of Chinese porcelain, some of it painted with his own coat of arms. As well as the mausoleum Sir Charles built a new house at Highlands which he leased to his sister in law and her husband, Captain Webber. When Captain Webber died his widow stayed on in the property. 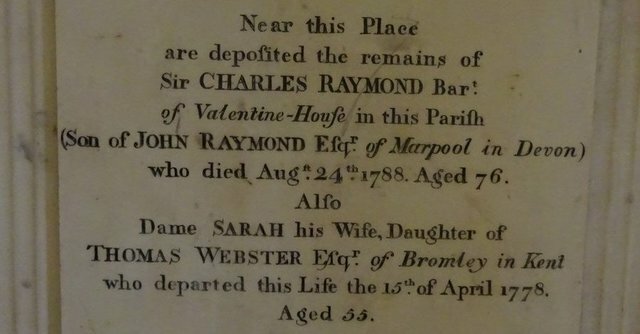 In 1778 Sir Charles wife died and was buried at St Margaret’s Church in Barking. Soon after her death Sir Charles moved out of Valentines and into Highlands with his sister in law. 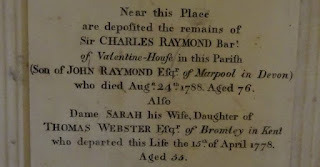 Sir Charles died on 24 August 1788 and was buried with Sarah in the Raymond vault at St Margaret’s. The unused mausoleum quickly became Ilford's premier tourist attraction and innumerable postcard depictions of it exist from the late nineteenth and early twentieth century.